Residents from nursing homes around Salisbury were invited to an indoor garden party at Wiltshire College to celebrate the Queen’s 90th birthday. 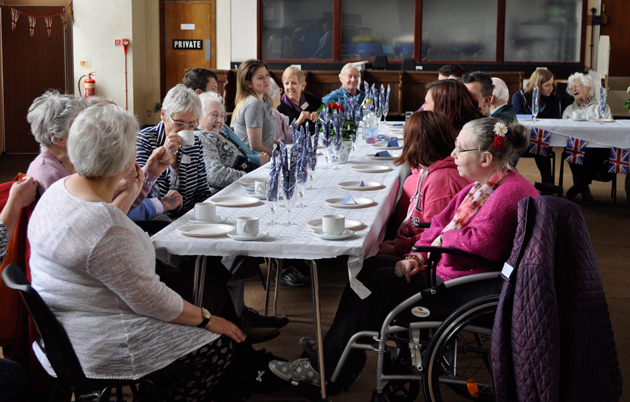 The tea party was organised by level three health and social care students and staff to create new links with the community and support elderly residents. Around 30 elderly residents, accompanied by family members or care staff, attended the party where they tucked into sandwiches, cakes, tea and coffee made by students. They were also treated to hand massages and nail painting by beauty therapy students, live music from performing arts technician Chris Wynn, a slide show of photographs of the Queen and bingo. 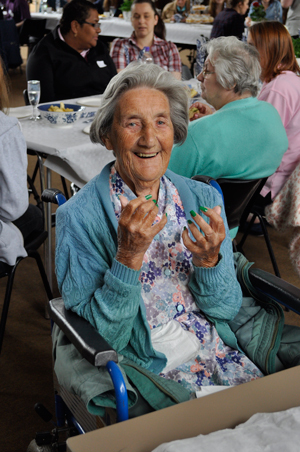 Ninety one-year-old twins Doris Russell and Betty Ellis were both “thrilled” to get their nails painted for the first time in their lives and chose a colour to match their cardigans, green. Betty said: “It is fantastic and I have had an absolutely wonderful time here at the college.